Mobile network operator MTS and MTS Bank, both owned by Russia’s Sistema group, have launched an NFC payments service in conjunction with MasterCard. The service is available to customers in Moscow today and will be expanded to other major Russian cities in the near future. 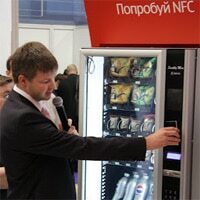 MTS Bank, mobile network operator MTS and MasterCard have launched Russia’s first commercial NFC payments service. The service allows MTS customers to make payments of up to 1,000 rubles (US$31.74) with their mobile phone without entering a PIN and is available in two versions, allowing customers to choose to add a SIM+antenna solution to their existing phone or to upgrade to a Sony Xperia Sola phone with built-in NFC functionality. The SIM+antenna solution is available today from MTS stores in the Moscow area, with availability due to be extended to other major Russian cities in the future. The Sony NFC phones are set to arrive in MTS stores this month and will be exclusive in Russia to MTS.